The addition of the new store will add to the growing development along the Route 190 corridor, Stafford’s Highway Business zone, where Aubuchon Hardware and O’Reilly’s Auto Parts stores have also opened in recent months. PZC Chairman Nancy Ravetto said the approval was streamlined in part by an informal, pre-discussion meeting the commission requested in order to review the site plan and make suggestions regarding their proposals that the commission would be in agreement upon. Presently, the commission is working on medical marijuana production regulations and a floating zone for businesses that it hopes will foster an even greater interest in local development. 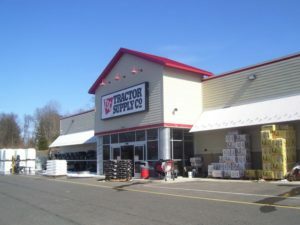 According to its website, Brentwood, Tennessee-based Tractor Supply Company is the largest operator of rural lifestyle retail stores in the country. The stores cater to the “gentleman farmer” selling everything a farmer, horse owner, rancher, part time and hobby farmer might need – with the exception of tractors. It was founded in 1938 as a mail order tractor parts business and today owns and operates more than 1,700 stores in 49 states. The product line includes clothing, equine and pet supplies, lawn and garden supplies, riding mowers, tools and equipment for contractors and tradesmen, and more.